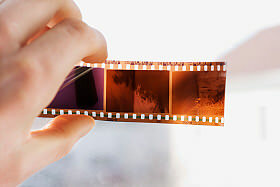 Digital photography is recent enough that you may still have albums or boxes filled with photos printed from film, either negatives or slide positives. The days of film have passed, generally, except for some professionals and the last holdouts. Since the present and future state of photography is digital, it only makes sense to transform those old pictures into digital images, and for many of the reasons in this PhotographyTalk.com article. Digitizing photo prints is probably a priority because the images tend to disintegrate faster than negatives and slides. Colors lose their vibrancy and the paper yellows, plus they’re handled more than negatives and slides, meaning prints are more susceptible to fingerprints, fold marks, etc. Because negatives and slides are less handled and stored in a clean, dry place, they’re apt to have a longer shelf life. For the average amateur photographer, converting photo prints to digital files with a scanner is probably the easiest and least expensive method. Professional photographers will often scan negatives and slides to preserve them, but that requires expensive equipment. Again, if your negatives and slides are never touched, then they don’t need to be digitized. You can either purchase an affordable scanner (many are less than $100) to digitize your photo prints or send them to any of the many scanning services that you can find online. They’ll scan your prints and send you a DVD of them as digital photos. Either option will work whether you have just a few prints to scan or hundreds (maybe thousands). Scanning a large number will take some time, but that will justify the purchase of a scanner. Scanning services will obviously charge you more to digitize a large amount of prints, but that is probably easier, and the money you would spend on a scanner can be applied to their fee. The scanner’s resolution is expressed as DPI, or dots per inch. Most scanners’ output is 1,200 DPI or greater. Some scanners offer a choice of resolution settings. A resolution of 1,200 DPI is certainly enough; in fact, you can probably digitize your photo prints just fine with a scanner of 300 to 600 DPI, which will save you some money. The scanner’s speed is another important consideration when purchasing a scanner, so check the specs before you buy. You’ll want a faster scanner speed if you plan to scan a large number of photo prints. Faster speed translates into a lower resolution, but since 300 to 600 DPI is sufficient, you can use a faster speed to reduce your scanning time. The feeder device on the scanner is also a factor when selecting a scanner. Again, if you will be scanning hundreds, even thousands, of prints, then look for a scanner with an automatic feeder. You can stack your photos in the feeder and the scanner will do the rest. Be prepared to pay more for a scanner with the automatic-feed function. Another benefit of scanning your old photo prints is that once they are digitized you can open them in photo-editing software and return them to very nearly their original condition or even improve the contrasts and eliminate the red-eye that has been there for years. Digitizing your photo prints from film preserves them for many more years of viewing by present and future generations.